“Diet” Soda has a perfect sales pitch. Have your cake and eat it too! 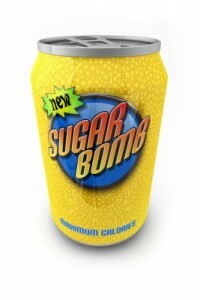 It promises to be as delicious as the “real thing” but zero or very few calories. 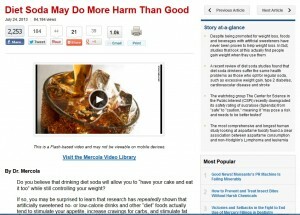 Research proves that in many cases it is far less bad to drink actual Soda with real sugar. Interestingly enough almost every overweight person I’ve ever worked with had to be convinced that Diet Soda was harmful to their weight loss efforts. One of my favorite resources on health, wellness, fitness and nutrition is Dr. Joseph Mercola. It was on his site that I first learned about the effectiveness of EFT. It was also Dr. Mercola who introduced me to a fabulous approach to exercise that only takes 20 minutes per day 3 times a week, Interval Training (more on that in another post). I have two friends who I love as brothers. Both are extremely active. Both “think” they know how to eat healthy. Both of them have significant bellies sticking out in front of them. And BOTH of them drink diet soda. When I bust them on it, they always say, “well I don’t drink this very often.” Sorry. I’ve got to “weigh in” here and join in the cry out against diet drinks. Then come back because I get going on a pretty good “rant” below! First of all I think the whole idea of a “reduced” calorie “diet” is a bad idea to start with. Notice what the first part of the word “diet” actually says: “DIE”. As a hypnotherapist with many years of experience working with people to lose weight and get fit, job number one is to communicate to their unconscious mind that there is no famine. Because as you lower your caloric intake it triggers a fear response in your body that triggers “saving fuel”. Your body literally forces itself to be more conservative with the calories you are giving it which forces your body to retain fat. Second of all. Drinking some chemical concoction that contains excito-toxins and all kinds of artificial crap that literally causes cancer in rats, is just plain crazy. Just because the commercials on TV show slender, healthy, active actors and actresses using the product doesn’t mean they actually do. And my final rant and rave point for the day is this: if you are overweight, it is not just about the food. 99 out of 100 people who are overweight are “self medicating” with food and drink in a misguided attempt to try to feel better. They are trying to feel better because they are hurting. Old wounds, old limiting beliefs, old patterns of behavior, old “programs” are running 24-7 in their unconscious minds. They are trying to feel better because they are miserable in their jobs and relationships and don’t know how to get out of the trap they’ve gotten themselves caught in. And until that actual problem is addressed, nothing you put in your mouth is going to permanently satisfy or soothe the hurt. There is no pill, no special diet, no new workout, no operation, no “will power” based program that addresses the real issue. Take a moment and consider this: If you were truly living the full, joyful life you imagined for yourself as a kid (before everybody told you you couldn’t) would you be overweight and miserable? The truth is that if you were truly living up to your full potential as a radiant, self aware, personally empowered human being, you would barely think about food except as a necessary interruption in your amazing life. Ok. enough ranting. I just want you to know that there is another way. You can break out of this. You just need the right information and a guide who can keep you on the right track. I don’t know if that guide is me, or someone else. But one thing you can do today is STOP drinking diet soda. Start experimenting with an ice cold glass of water with a squeeze of lemon. Had enough of the diet roller-coaster? When you are ready for real results that are sustainable for the rest of your life, consider hypnosis. Feel free to use the handy contact form below to let me know you’re ready and I will get back to you (between Tuesday and Friday).